These cottages were built by Wrights elastic webbing factory for their workers in 1893-94. The older photograph was taken in the early 1900s. It is surprising that the railings have survived to the present day and were not removed during either of the wars. The cottages have been renumbered since they were first built, and the block shown in this picture, with the canopies over the doors and the gabled upstairs windows are numbers 36 to 46 (left to right). 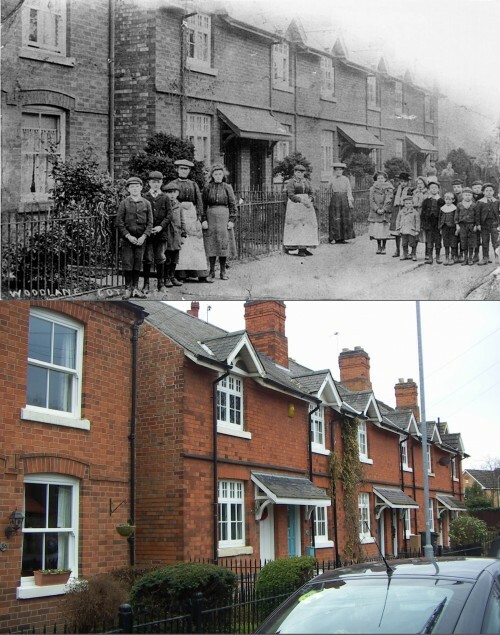 When taking current photographs to compare to the old ones, vehicles are often a problem as the older houses where obviously not built with cars in mind. Wood Lane was particularly difficult and despite several visits, the cars continued to make their presence felt!